Monthly Article January 2014 – The Horseshoe, still just as crabby! The horseshoe crab is a marine arthropod well known for its distinctive shape and unusual blue blood. The horse shoe crab has been called by many a living fossil due to its supposed antiquity in the evolutionary world view. Until 2008 it was thought to have had a 350 million year old history. 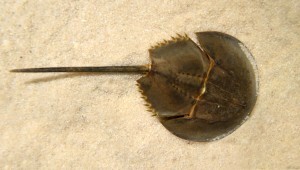 A fossil horseshoe crab found in Canada[i] then pushed its known existence on the evolutionary timescale back a further 100 million years to a total of 450 million years. Although the new fossil horseshoe crabs have been assigned a new genus, Lunataspis aurora, it is unknown whether they were simply juveniles or where fully grown, it may turn out that they are simply juveniles of an already known species. It is acknowledged that previous horseshoe crab fossils found in the Jurassic (145-200 MYA) and Carboniferous (299-360 MYA) periods show that horseshoe crabs greatly resemble the ones that we observe today showing very little change. Now the resembling has been pushed even further back, back to the Ordovician (444-485 MYA). “This body plan that they’ve invented, they’ve stayed with it for almost a half a billion years. It’s a good plan,” Rudkin, one of the authors of the paper describing the fossil horseshoe crabs, told LiveScience. “They’ve survived almost unchanged up until the present day, whereas lots of other animals haven’t.”[ii] The Horseshoe is apparently still just as crabby! But just how did the horseshoe crab invent this wonderful body plan and then manage to keep it for 450 million years while other animals have not? Rudkin’s statement make no sense in the evolutionary worldview as the horseshoe crab could not have had a choice in its body plan. Instead it would have arisen through random mutations from an earlier completely unknown predecessor. It is amazing that even though the evolutionary timeline of the horseshoe crab is pushed back to nearly half a billion years their almost complete stasis is not explored or questioned. It begs the question why no change? How in the magical world of evolution can this stasis occur? Yet at the same time we are shown diagrams in universities, museums, etc, that human beings have evolved from a 3 foot high, tree dwelling genera, the Australopithecines, in under 3 million years. This would have required a massive amount of change to have occurred, and yet the horseshoe crab has remained unchanged in 450 million years? The evolutionists seem to want to have it both ways and just hope that no-one will notice. Yet from a biblical perspective we should not be surprised with the horseshoe crab as Genesis teaches us that God created animals to stay within their created kinds just over 6000 years ago. A fact that we consistently observe. The invention of the wonderful body plan and amazing design of the horseshoe crab with its advanced immune system[iii] should be fully attributed to its creator God. We can also note that the fossil horseshoe crab specimens that were found were exceptionally well preserved and ‘included patches of the animals’ outer-covering and even evidence of their compound eyes.’[iv] Which would mean that the animal needed to have been buried in sediment quickly. This is wholly consistent with the conditions that the global flood 4500 years ago recorded in Genesis would have provided. Again the naturalistic man made evolution myth shows it inconsistencies, this time through the horseshoe crab. “Has not God made foolish the wisdom of the world?” 1 Corinthians 1:20. [i] RUDKIN, D. M., YOUNG, G. A. and NOWLAN, G.
KONSERVAT-LAGERSTÄTTEN DEPOSITS, MANITOBA, CANADA. Palaeontology, 51: 1–9.